Thirty-odd years ago Coca Cola got a little bit spooked by the marketing campaign run by their arch competitors Pepsi – the Pepsi Taste Challenge. The campaign, which ran in adverts over here too, showed blind taste tests where people time after time selected Pepsi over Coke when asked which one they preferred. There’s a paradox here: on the one hand Coke lost its nerve and started focusing more on its competition than on its customers. But on the other, it started listening absolutely to its customers (but in the confines of a laboratory experiment) and changed its products on the basis, basically, of putting people into a room and asking “Do you like this?”. Which brings me to yesterday’s announcements of Windows 10. The latest incarnation in logical branding from the people that brought you “Windows RT 8.1 update”. Windows 10 brings the Windows product back to where the logical extension of Windows 7 should have been – primarily an operating system for “traditional” personal computers – things with a screen, keyboard and mouse. Windows 8 was a touch-first operating system that brought the promise of new device types, fusing the benefits of tablets and PCs. For many people, though, it seemed the benefit of a tablet was that it wasn’t a PC. The hybrid device is one that when you put people in a room they’ll say “Yes, that sounds like a good idea” but when it comes to actually buying and using one, something of an “edge case”. A bit, if you will, like a TV that has an integrated DVD player. Sounds like a good idea, but you’d probably only buy one for a kids bedroom, and then only if you didn’t like your children very much. Windows 8 was a product designed in laboratory customer consultation in reaction to competitive pressure. 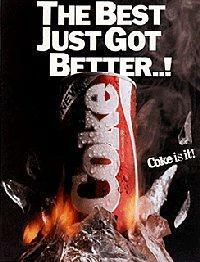 Coke were able to ride the blip of New Coke and maintain brand superiority over Pepsi in the early 80s. It’s only more recently that the whole sector of fizzy pop stuffed with sugar has become more generally pressured on the grounds of health, and why Coke (and Pepsi) now produce a much broader range of beverages including water. In the period leading up to Windows 8 and since, the market has changed in the world of the PC. When its predecessor Window 7 was released in 2009 (after the other blip of Vista) smartphones were still gathering market share, with the iPhone still in only its second year and Android nascent. Today, Windows PC account for around 30% of the devices used to access the internet, Android is there or thereabouts as the most popular “personal” computing operating system, and tablets (the device that obsessed the design of Windows 8) might yet be proven to be something of a short-lived mass phenomenon in terms of importance (particularly with the release of the big-screened iPhone). So Windows 10 appears to be going back to basics as a keyboard & mouse-based operating system at a time when people are really starting to question how much they need those devices to get things done. An edge-case device for doing large amounts of typing and spreadsheeting. Windows Classic, if you will. But for the most part tech companies don’t like the idea of selling the old – even if Apple have managed to wrap up all of the century-old Bauhaus movement in their products in recent years. It’s always about the new new thing, because the revenue models are all based around selling new stuff on regular replacement cycles. That’s why mobile phones these days are less likely to have easily-replaceable batteries or abilities to add memory. So what for Windows 10? Well, it’ll probably be reasonably successful as it will appeal to the legions of IT departments who saw a practical and support nightmare in Windows 8. It will sell millions and millions of licences. But does it do anything to address the central question facing Microsoft? Will it address that we’ve moved beyond the PC and have done so increasingly with products and services from other companies? Those more fundamental issues are no clearer than they were back in 2011 before any of the Windows 8 product was public knowledge.